When is the last time you climbed up a ladder to check on your gutters? If “recently” was not an answer, you might want to do so soon. It’s better to rest assured that they are clear of clogs and aren’t broken in areas before a large storm hits. With hurricane season kicking off at the beginning of June and lasting through the end of November, the time to check is now, and not when a colossal system is bearing down on North Carolina. Keeping your gutters clean is tantamount to preserving your home and its appearance, as well as the functionality. When gutters are clogged, water will overflow out of them, and may cause significant damage to your property. If your gutters are dirty or need to be replaced, rely on the Raleigh-Durham, NC gutter installation experts at Gerald Jones Company. Our gutters are seamless, allowing for an attractive finish as well as enhanced practicality. We also offer downspouts and gutter covers, as well as gutter guards and installation services. Gutter guards help keep even the toughest-to-clean areas in your gutters clean and free of accumulating leaves, twigs and other debris. 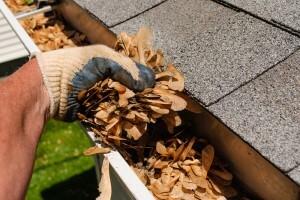 Investing in Gerald Jones Company’s gutter guards also significantly cuts down on the amount of time you spend outside clearing out gutters in the first place. Our Raleigh-Durham gutter installation crews can place these over older gutters, if you’re satisfied with the ones you have, or over new ones, if you’d like to maintain their pristine condition. Don’t make the potentially costly mistake of ignoring your gutters. Pick a day soon to check out your entire gutter system. If something doesn’t look right, or if you’d like to keep them clean after clearing out debris, Gerald Jones Company can help. Call us at 919-286-1700 or contact us online to learn more about our comprehensive Raleigh-Durham gutter services. This entry was written by geraldjones, posted on June 30, 2015 at 9:46 am, filed under Uncategorized. Bookmark the permalink. Follow any comments here with the RSS feed for this post. Both comments and trackbacks are currently closed.